Southern Idaho is your cure for cabin fever this winter. Come experience a snowy season under broad, blue skies. Explore the back country. Discover your new favorite ski resort. Soak in soothing mineral hot springs. There are so many things to do in Southern Idaho in the winter, but we’ve narrowed it down to the top 10. 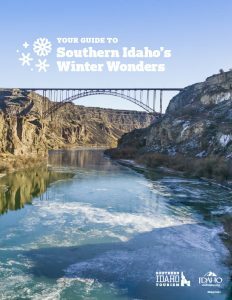 The question is: How many of these top 10 things to do in Southern Idaho will you check off your list this winter? Experience the pure powder of the backcountry at Soldier Mountain—in luxury. Soldier Mountain’s 12-person snowcat comes equipped with a flat-screen TV and big windows to enjoy the spectacular views as you journey to an action-packed skiing experience. Combine that with a stay in the Smokey Dome yurt and you have a perfect Idaho backcountry weekend. Pro tip: Book now — these spots go fast! The Trinities Mountains and the area around Fairfield offer miles and miles of snowmobiling possibilities. If you’re looking for things to do in Twin Falls, the Diamondfield Jack area south of the city has more than 200 miles of groomed and marked trails of Sawtooth National Forest and Bureau of Land Management land. The trails are easily accessible by I-84. Mount Harrison, located near Pomerelle Ski Resort and accessed by Howell Canyon, features incredible panoramic views of the valley below and reliably deep powder. Of course, you can always go off-trail — there are plenty of places to play along all those groomed trails! But don’t worry about competing for space: Only 3,500 snowmobiles are registered in Southern Idaho each year, which means you’ll have plenty of room to roam. Pomerelle regularly racks up tons of powder thanks to its location in the Sawtooth National Forest and its especially high elevation: 8,000 feet at the base with a vertical drop of 1,000 feet. The area is graced with snowstorms from California and Utah that bring deep snow—around 500 inches annually—to 24 slopes. In other words: Awesome skiing. And did we mention that a full-day adult pass costs only $45? Every winter, the black, alien landscape of Craters of the Moon is transformed into a snowy white winter playground. Where else can you ski across a dormant volcano? Try the 1.5-mile Snowshoe Loop Trail or the 7-mile Loop Drive, both groomed for skiers and suitable for both kids and adults. Both skiing and camping are free during the winter at Craters of the Moon, but if you don’t want to rough it, try staying in nearby Arco. See the silent “city” and amazing rock formations while snowshoeing through the City of Rocks and Castle Rocks State Park. During the winter, this outstanding geological area offers the perfect place to find quiet and some of the most spectacular scenery in the West. As you snowshoe through City of Rocks, think about the hardy pioneers who traveled through this area on the California Trail and gave it its name. We think you’ll be as fascinated about these ancient rock outcroppings as they were. Bonus: You can stay overnight at the Lodge at Castle Rock Ranch, a cabin at the state park, or even a yurt! The century-old lodge has WiFi, wide-screen TVs, multiple bedrooms, a full kitchen, and sleeps up to eight people. Southern Idaho’s hot springs are the perfect temperature all year round, and they’re especially cozy during bone-chilling winters. Check out Miracle Hot Springs, which also offers camping domes with radiant floor heating; test your balance skills on the floating log at 1,000 Springs Resort before retiring to your cabin for the night; or visit Banbury Hot Springs, which has been soothing sore muscles since 1920. Durfee Hot Springs, located at the northern edge of Almo, features a developed outdoor pool—but be sure to call ahead (day and hours change seasonally). Not all of Idaho’s birds fly south for the winter. In fact, winter is a great time to go birding or to watch birds of prey. The Hagerman/Thousand Springs area for the best opportunities during the winter, when waterfowl concentrate in the area. Check out Banbury Springs, Tuana Gulch, and the Hagerman Wildlife Management Area for the best vantage points. You’re likely to see Canada geese, mallards, common goldeneyes, ring-necked ducks, herons, egrets, and more. To catch a glimpse of a majestic bald eagle — or 10! — wait until the weather gets closer to zero and head toward the Westpoint Store & Café and entrance to Box Canyon Reserve near Wendell. Skiing isn’t the only game in town! Magic Mountain Resort near Twin Falls has a tubing hill pass that’s perfect for an afternoon out—or even an office field trip. Magic Mountain gets more than 200 inches of snow every year, which makes it a fun and affordable option for snow lovers. Tubing hill passes are only $15 for two hours, or $12 each for groups of more than 20 (call for reservations). Winter hours for the tubing hill are 10 a.m. to 4 p.m. Their ski hill and lodge are also open for business, so plan for a whole day of fun in the snow. Think golfing season is over? Not in Southern Idaho where you can golf even in the winter time! You can golf well into the winter here. Winter rates are in effect at Clear Lake Country Club in Buhl, River’s Edge Golf Club on the Snake River in Burley, Canyon Springs Golf Course in the Snake River Canyon in Twin Falls, 93 Golf Ranch in Jerome, the Twin Falls Municipal Golf Course, and Pleasant Valley Golf Course in Kimberly. With prices ranging hovering around $10-$15 for nine holes and $20-$25 for 18 holes, you’ll get a day of fun for a true bargain. Southern Idaho is home to restaurants and lodging that will help you take the chill off. From mom-and-pop restaurants to fine dining, and from cabins to big hotels, you can find a place to make a weekend of your winter adventure. Check out the Southern Idaho Tourism website for a full list of lodging options, from Twin Falls to Heyburn to Oakley and beyond. If B&Bs are more your speed, check out Southern Idaho’s cozy inns. Dine with a view of the Snake River Canyon at Elevation 486 or Canyon Crest and feast on locally-sourced food. Want some down-home cooking after a day of backcountry exploring? Check out StevO’s in Heyburn. Have a beer at the historic Henry’s Drift Inn in Rupert or Magic Valley Brewing in Buhl. Ready to upgrade your winter? 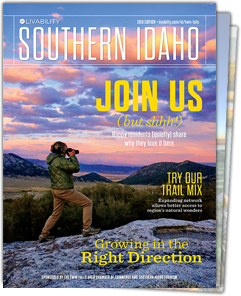 Head to VisitSouthIdaho.com for the latest news, events, and can’t-miss info about this spectacular region. You’ll find everything you need to plan your trip, including the Southern Idaho Adventure Map, trip itineraries, and lodging and visitor information. Ditch the crowded ski resorts, the packed trails, and your same-old, same-old winter activities. Winter adventures await in Southern Idaho! Answer a few quick questions and begin downloading your guide to this season’s 10 best bets in Southern Idaho.